Last Updated 1 January 2016. License key: 18494462448836760586 (valid until 1 January 2048). If you find this program useful, please consider clicking on the button to the left to donate two dollars. 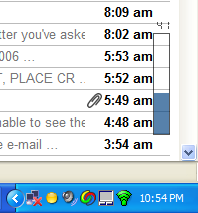 Reason for existence: The standard Windows XP battery meter had two major shortcomings: it did not display the time estimate unless the mouse cursor was hovered over the system tray icon in the taskbar, and furthermore, that icon had too few states - it looked exactly the same whether the battery status was 25% or 3%. So, this program was written to address those issues back in the day. Despite its XP origins, it still works on modern versions of Windows. Completely transparent background: all you see is the power bar and the numeric displays. Displays both the percentage battery remaining and an estimate of the time left. Can be used during a full screen PowerPoint or Acrobat presentation. Automatic detection of background color: light or dark drawing colors are automatically selected. All colors fully configurable via user-friendly Windows color picker. .NET Framework version 2.0 (or above). This Windows component may already be installed on your system because other applications may use it too (this is somewhat analogous to how DirectX is used by many computer games). It can be obtained for free via Windows Update by selecting to install "Custom" updates and looking in the "Optional Software" section. Note: if you receive an error message about "MSCOREE.DLL", this indicates that you do not have the .NET Framework installed. To exit or configure Battery Meter, double-click on its system tray icon (a colored sphere) to access the control window. The meter can be moved by dragging the colored bar with the mouse pointer. To automatically start Battery Meter upon logging into Windows, run the corresponding program in Battery Meter's Start Menu group. 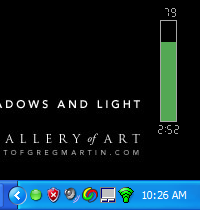 Battery meter floating transparently above the desktop, indicating a charge level of 79% which is estimated to last 2hr 52min. The system tray icon for Battery Meter is the green sphere. Over a light background, Battery Meter's colors automatically darken to maintain visibility. Also, the colors of the bar and the system tray icon have changed to reflect a moderate battery level. No time estimate is provided because the battery is charging. You are visitor number since 14 October 2006.